Ford Alumni and five Willamette University Ford Scholars to join him, but as far as he knew, he was the only Ford member to participate. About 40 to 50 volunteers pitched in, many from the immediate neighborhood, some from Target, and some from South Salem High School. He brought his cousin from Sandy High School. From 9 a.m. to noon, they worked to remove English ivy, holly and laurel bushes using their hands, shovels, hoes, rakes and saws. Baird worked in a smaller sub group, freeing a fence and a Douglas fir tree from the grasp of thick ivy vines. “It felt good being able to leave that park better than I had found it so many years before,” Baird said. 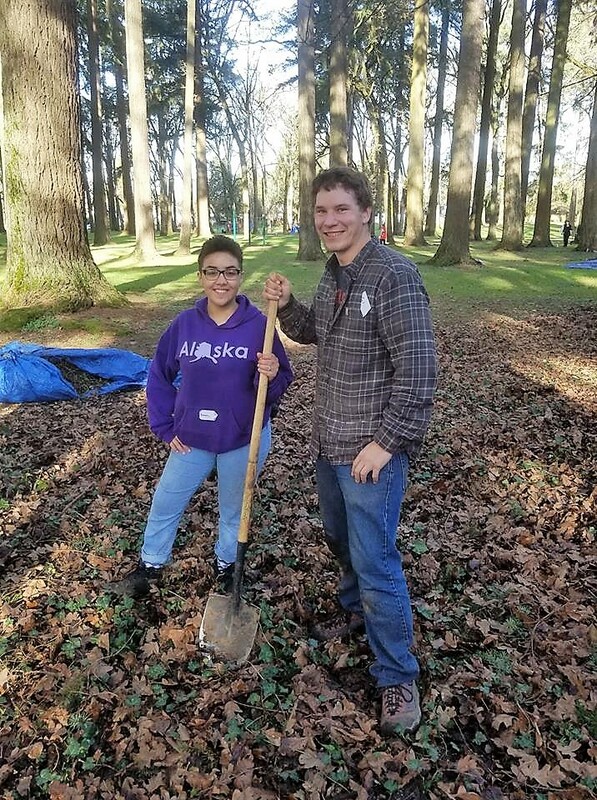 Photo: Class of 2011 Ford Scholar Patrick Baird, right, volunteered on MLK Day of Service with his younger cousin, Ayaunna Claus.